Groups Blockbuster Movie Illustrations: Over 160 Clips For Your Ministry! Now you can use quick clips from over 160 popular movies to illustrate what the Bible has to say about the issues teens face. Just cue your video, play the clip, and discuss the questions provided. Includes Scripture, topic and movie indexes. 158 pages, from Group. 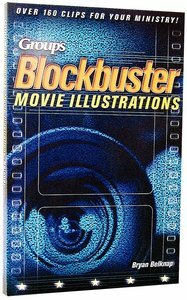 About "Groups Blockbuster Movie Illustrations: Over 160 Clips For Your Ministry!" Now youth workers can use clips from today's most popular movies to vividly illustrate what the Bible has to teach about the critical issues teenagers face. These clips are great as attention-getting openings, memorable closings, or starting points on which to build lessons. Includes more than 160 movie clip illustrations. Now you can use clips from today's most popular movies to vividly illustrate what the Bible has to say about the important issues teenagers face. These ideas work well as attention-getting openings, memorable closings, or starting points to build a lesson on. Reach students through a medium they appreciate and understand (Actual videos not included). ^ Click tell me more to see all the movies suggested in this book. Bryan Belknap is the Media Editor for GROUP Magazine and author of Group's bestsellers, Group's Blockbuster Movie Illustrations and Ultimate Skits. Bryan is the creator of www.ministryandmedia.com, an online resource featuring more great illustrations and reviews from popular movies, music and TV shows. He and his wife Jill live in Los Angeles.